We never charge for an estimate for any of our home services. Book your appointment for air conditioning repair or install, plumbing, home insulation, or heating and HVAC services now. Every service call, every new unit installation, every home service project - done right - the first time. It's what we expect from our team as we know it's what you expect too. 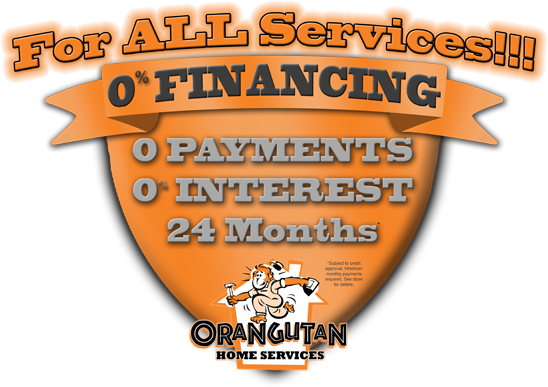 We're confident that with just one call to Orangutan, you too will see us as Chandler's unquestioned best in home services. Chandler residents and business owners - you know we love you and love hearing when the feeling is mutual. Our referral program lets you brag about the stellar service you received with your air conditioning repair, plumbing and insulation installation and pays you back for doing so. So go ahead and tell all of your friends, family and neighbors and you'll earn bonuses and special promotions as our thanks to you. Learn more here about our referral program now. We are a total home service company, specializing in air conditioning repair and service while also providing the absolute best in plumbing, attic solutions (insulation and Aeroseal) and home security. Find out more about what home services our Orangutan team of professionals provides to all of Chandler and its surrounding areas. Since 1993, Chandler, Arizona residents have understood that for the absolute best in AC repair and HVAC performance – only Orangutan Home Services will do. Our team of dedicated professionals have just one priority: Providing you, our Chandler neighbor, with the most dependable, highly-knowledgeable service that can be found anywhere. Recently, we were chosen as the #1 Air Conditioning & Heating Contractor in the United States for the third consecutive year by The HVAC News, an award given to only 1 home services provider out of 80,000. With the experience of over one million service calls and over 50,000 new air conditioner unit installations, our team at Orangutan Home Services is certain to give you the highest quality and most efficient service available. Our expert team of technicians and customer care professionals work together to ensure that each and every one of our Chandler customers receives the level of service that they both expect and deserve. Being recognized by industry experts as the best is simply a reflection of our appreciation for the honor you’ve given us by choosing us for AC repair and installation, plumbing, insulation and other home services. Discover the difference an Orangutan makes by calling the absolute best AC and heating company in the Chandler area at 602-892-9948.